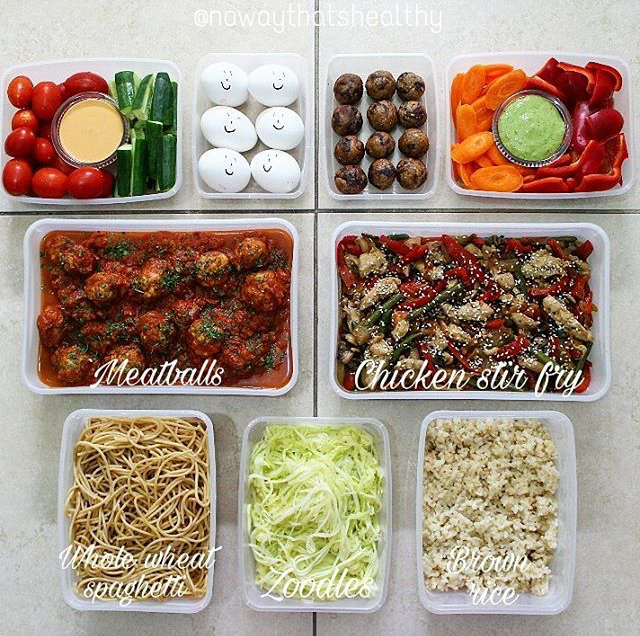 Family style Meal Prep 1 - No Way That's Healthy! When I have time I try to cook up some meals to have on hand during the week. It’s not always easy to whip up healthy meals with four little kiddos at your feet. That’s why when they are asleep/at school I like to get cooking done! No excuses to order in pizza or have a bowl of cereal when it’s been a long day. I just open my fridge and there are meals ready. I also made some after school snacks for them (and me!) which I think makes me a total supermom! Feeding healthy meals to your family can be tough. We all have picky eaters. To prevent a mealtime meltdown I make sure to have different side dish options. For example, I’ll be having the zoodles, but my kids prefer the spaghetti (and husb will have both). And if you sit down with your kids and eat the same thing they are, they will be more likely to eat it as well. Give it a try! *I always make a lot of each dish that way I have enough for at least two meals per dish. -cut up veggies with homemade cilantro dressing and thousand island dressing for dipping. -hard boiled eggs, which I actually baked in my oven 350F for 30 minutes. -energy balls, made with oats, dates, almond butter, flaxseed, vanilla and some mini chocolate chips. -Healthy Meatballs – recipe HERE, I did half ground meat half ground chicken. We love it! -Chicken Stir Fry, Just tons of veggies and marinated chicken in hoisin, soy sauce, garlic and ginger. -round brown rice, this I find to be the tastiest brown rice that most people enjoy.